And a small request. Not only do I not always get my Daily Messenger, but I sometimes do not get to actually read it unfortunately. News, like that above, could be sent to me by any number of informed people in our town. It would help, just in case I happen to miss it! And yet another "Thank you" to the Messenger for keeping all of us informed! for some great information and insight into what these companies are trying to do to our areas and towns. I would like to thank our Town Board (or most of them!) and our Planning Board for all their hard work and research. It is a rare thing nowadays to see public officials take the concerns of their residents and the welfare of their localities (the 'soul' of S.Bristol) over some cash in hand. I, for one, will remember this at election time. South Bristol now has more than it's scenery to be proud of! Another thank you to all those who did attend the August 11th Town meeting! I wish I could have been there. It's a good feeling to know our folk can work together! Yes, we can rest, but not our neighboring towns! Prattsburgh is already under attack. Bristol may also be. I, for one, offer any help I can to our neighbors to fight this problem. All our neighbors are welcome to use any of the wind mill information available here in your fight. If there's anything else I can do, ask! 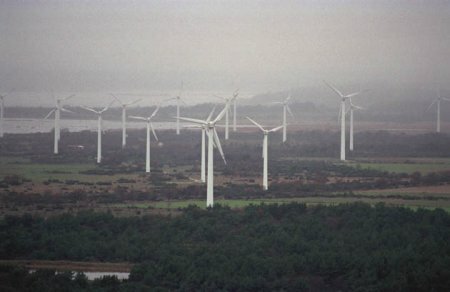 For anyone who missed the article in the Daily Messenger of Sunday, August 17, 2003: There is a "Guest Essay" written by Ruth Matilsky about the wind mill farm problem in Prattsburgh. This is one of the best, well written articles on the subject I have yet read. Thank you Ruth for putting what most of us think into such excellent wording! I never even thought of the insurance problems! I urge all concerned citizens to read this article! To those coming in late, or looking for something new: I doubt there will be any need to update or change this page. As of August 18, 2003, this chapter of South Bristol Views should now be relegated to history and will be left here for a while for those interested, and to help our neighbors. If there's any need for a change, I will post a notification on the main page. How much is a soul worth nowadays? How about the soul of an entire town? Yes, South Bristol has a soul. It's a kind, generous, nurturing soul with beautiful outlooks that draws friendly, nice people to it like a magnet. Just when I thought the fight was over. I had relaxed in the comfort of thinking that the residents of South Bristol had read the facts about windmills and the Ecogen project and we no longer had anything to worry about. Until I picked up today's Daily Messenger (08/07/03) and saw a "Guest Essay" by Mitch Cornish, one of out Town Board members. Obviously Mr. Cornish has NOT read the facts. Obviously Mr. Cornish cares little about South Bristol or it's residents. Obviously Mr. Cornish has few facts available on his side or he wouldn't be pushing the America Flag in our face and trying to associate this disastrous wind mill project with some kind of patriotism or support for our troops. Who does not support our troops? And what does that support have to do with this wind mill project? I was extremely offended by the insinuation that people who do not want this wind farm are unpatriotic, hate our president and don't support our troops! If Mr. Cornish is intelligent enough to associate foreign oil with the current war then why can't he understand the simple facts about wind mills and this project? Or does he have another agenda or something to gain from it? No insinuation, just a question as I can not for a second understand why anyone with above a grade school education would be in favor of this project unless they had some kind of personal gain involved. Building the wind farm in South Bristol will not have any affect at all on the burning of fossil fuels. That's a fact! The United States does not need forein fossil fuels. That's a fact also! We have thousands of oil wells (not to mention coal) in this country capped and out of use for the political reasons of buying oil from the Middle East. It has nothing to do with supply. Mr. Cornish says that South Bristol lost $90,000 in sale tax revenue in 2002. With what facts? Even if true, could there be any reasons? So we sell the soul of South Bristol to Ecogen for $100,000 a year. For how many years? And that is not a definite amount. It based on how much electricity is produce by the farms. What if they only produce enough to give South Bristol $50,000? What if they don't produce at all? No income. And we're still left with the devastation of the mountains. Even Mr. Cornish states that we could receive 100,000. It's a hope, not a fact! Mr. Cornish likes the looks of wind farms. Fine, go buy a house under them! At this point, we won't miss you!! Most people, especially those that live near them do not like the looks. And once they're built, they can't be changed. We're stuck with them! Mr. Cornish tries to compare Bristol Mountain's (the ski center) expansion to the wind farm. Apples & oranges! Bristol Mountain HAD to make sure there was no erosion or they would be out of business altogether! They made grass covered hills that had to be functional, last and be pretty for their customers. Ecogen wants to make 4000 acres of gravel parking lot! They don't care if there is erosion as long as their turbines stay up for a few years to make the tax benefits. There could be no logical comparison between the two projects! Mr. Cornish tries yet again to use the old "not in my backyard" scenario about the people who do not want these wind farms. Hasn't this dead horse been beaten enough? I notice that Mr. Cornish lives about as far away from the proposed wind farm as you can get. No wonder he's not worried about noise, lights and scenery! But all of Mr. Cornish's misleading statements must be taken as absolute facts because he "was an Army soldier" and he"support our president and our military". Well who doesn't? Those that are intelligent enough to fight these wind mill farms are now supposed to be unpatriotic? If you're a true American you'll want to destroy thousands of acres of mountain tops to plant useless politically motivated (and paid for) wind mill farms? Well I'll tell ya what. Next time we meet, you say something nasty about the US and we'll see who's unpatriotic! Say something good about these wind mill farms and I'll just walk away laughing at your ignorance! So, how much is that soul worth? $100,000? $75,000? Less? More? To me, the soul of South Bristol is priceless and we should do everything in our power to preserve it! Some people seem to be more than happy to sell it off to the first industrial devil that offers a few dollars for it! Just for those few who seem to think this fight is a "not in my back yard" thing: You're wrong and obviously have NOT read or understood anything anyone has said in protest of this project! It's a case of wrong project for the wrong place for the wrong reasons to make a very few people very rich! Use some common sense here folks. Why have all the proposed windmill projects been for the lowest populated and poorest towns in NYS? Money talks and sometimes pushes. Smaller amounts talk bigger in small towns without the political clout to fight this obviously political/money making movement. It is, after all, all about federal money going to the state which is then given to the windmill farm developer, with a tiny bit funneled down to the hosting town. And nothing but higher bills and extra cost to the people living in those towns. It has nothing to do with the environment or 'green energy' to the developers or state! If you have any concern for the actual facts, or to preserve our area's natural beauty and environment then do some true research and read what is available here. I received not only a reply from the author of one of the documents below, but a series of very interesting documents that I present here. Some are directly related to NY. Other are about issues elsewhere. All are interesting reading. Especially the blade & ice throw calculations where a tower (smaller than the ones proposed for S.Bristol) can throw ice 1500 feet! Some of these documents are in Adobe PDF format, some in Word DOC format and the websites file is an Excell spreadsheet. I suggest, for anyone truly interested, to definitely read at least the Turbine Blade & Ice Throw, Wind Energy Economics and Wind Farm Propose Offshore Virginia files. Thanks to Glenn Schleede and Cathy for their help! Turbine blade and ice throw calculations in PDF format. First, a "thank you" to the students for their presentation. And "thank you" to all those who did attend. I would love to hear your thoughts on this presentation! And now, for some interesting facts. Or lack thereof... It was obvious from the start that the students were showing a highly biased viewpoint in favor of these wind farms. There can be no doubt about it from anyone who attended the meeting. And since this was a presentation to our Town Planning Board, there needs to be some light shed on this problem. Their "facts" were gotten from places such as the American Wind Energy Association! How can that be unbiased since this is the premier organization promoting wind energy? Their reporting on the numbers of bird kills was actually laughable, if it wasn't so serious! They also reported facts such as the 'minimal' environmental damage. Small access roads and small clear-cut plots to build the towers. This was absurd and showed how little true research these students did. Ecogen has already stated that they would have to clear-cut "at least" a 350 foot diameter area for each turbine just to assemble and install the blades! The access road would have to be a six lane highway to accommodate the huge equipment and cranes needed for the assembly of the towers. Are we saying here that Ecogen doesn't know what they're talking about? These towers will be 750 feet apart. They need a 350 foot circle for the blade assembly. They need an area just as large for the crane. More area for additional construction equipment and places to put the tower section before assembly. This does not include the 50 to 75 foot diameter area needed for the construction of the foundation of the tower itself. Add these areas up for each tower and how much space is left that will not be clear-cut and leveled? Not much! They did some representing of how much energy the wind mills would save and how much CO2 would be saved by not burning fossil fuels for electricity. But they didn't balance this out with the fabrication, transporting, construction and maintenance of the towers themselves. A rather glaring and biased omission! They stated that the lights on these towers would be no brighter than the average porch light! How absurd is that? I don't have a 500 watt strobe illuminating my front porch and I doubt anyone in this valley did, or we'd all sure know about it! TWO 115 to 125 watt continuously operating lights (for 230 to 250 watts continuous). And the 60 watts of light the students would have us believe? Well yes that is part of the specification. But it's 60 watts at ground level! And we'll have 20 of them lighting up our valley! Why didn't the students mention the power savings from no one in this valley having to use outside lighting at night any more? And this still doesn't take into account the extra lighting needed at the blade tips because the blades extend 120 feet above the tower height! They stated how quiet the turbines were. And yet they were surprised that other people stated that they could be heard easily if the person listening was not directly in the same wind, such as in a car, or house! Again, poor research. They stated tower dimensions, but NOT for the type of towers proposed for South Bristol which will be much larger! They exaggerated the economic advantages of having the farms built, but ignored that fact that the wind farm would be tax exempt for FIFTEEN years! They completely ignored the fact that the power generated by the farm does not go to any local usage at all but is fed back into the main power grid system and can be used by anyone, from any state. And that the power grid lines would have to be updated or completely replaced all the way back to the main feed, at taxpayer expense (that's you and me!). They ignored the fact that power generated by wind cost US 1.7 cents per kilowatt MORE than power generated by any other method. All their data was stated on ideal wind and weather conditions and life spans from the propaganda spilled out by the wind energy companies... How much TRUE power is generated by the existing wind farms in comparison to the proposed amounts? Poor research! They did absolutely no research into the environmental impact of clear-cutting and paving over of 1200 acres of mountain side. How will that affect our water shed? Will there be mud slides? What about the animal habitat? What about the loss of the oxygen producing forest? How does that balance against your supposed 'green' wind energy after the environment cost of their construction? Trees live on CO2 after all and use it to produce oxygen! How much CO2 does 1200 acres of trees remove from the atmosphere every year? No, I'm sorry folks. It was a nice presentation and I give these folks a lot of credit for the attempt. But it was heavily biased and poorly researched. Too many facts were either ignored or hidden. I hope their professor really did take notes and has a sincere interest in the truth! Are you interested in preventing the destruction of 1200 acres of our mountainside forest land? Do you want South Bristol turned into a huge industrial park wasteland? --> The South Bristol Town Planning Board is having a meeting on Wednesday, November 20 at 7:30pm about the windmill farms. They are going to hear from students of Hobart College who have been doing research on the project. As mentioned elsewhere, today's (and proposed!) windmills are far from environmentally friendly or sound! If everything is added up, they do more harm than good. First is the direct environmental impact from their construction alone. Add to that their manufacture and the environmental cost of the aluminum both in production and eventual pollution. Aluminum is the single most costly and environmental unfriendly product in the world today! Visual pollution! Sure some people actually like the looks of these things. From a distance! And the ones proposed for our mountains tops are larger than any seen yet! "Green energy" is thrown about and people are afraid to even think about arguing the point. With regards to these windmills, it's an absolute falsehood! Examine the total picture. The cost of manufacture. The construction and resulting destruction of forest habitat and watershed. Maintenance. The higher cost to us for the electricity produced! Yes, windmill electricity costs us more than that produced by any other method. Add another item to this 'green energy' proposal. I have been recently informed that the current power grid going down Route 64 could not possibly handle the added input from the wind mill farm. There would have to be an entirely new power line system installed the entire length of Route 64 to reach Stid Hill. And not the common telephone pole low voltage system we have now. But the high voltage, high tension steel superstructure towers! Now I haven't heard much complaining from the Rt 64 side of the mountain. Maybe because they feel that they won't see the wind mills and won't be affected by them. How about this. The current laws permit the electric utilities to take over any part of your land they deem necessary to build their towers! How many people on Route 64 will have new electric towers built on what used to be their property? How will the Rt 64 valley look with these huge towers running down the full length of it? How much land and environment will be upset by the construction of these new towers and access roads? Okay, by now you're considering me as some kind of fanatic and crossing me off your list of believable people. That's fine, and wrong. I've done the independent research and listen to more than the heavily biased and politically correct reports generated in this country. I am not against true 'green energy'. I am completely opposed to anything nuclear! And I am a very practical person. There's always a way to accomplish a desired end, without hurting anyone. Building these monster aluminum towers on the mountain sides of South Bristol is not practical, not green, will hurt many people, and make a select few very rich! Here's a real treat, well, if only because I can now offer this map on the web site thanks to a policy change at DeLorme. 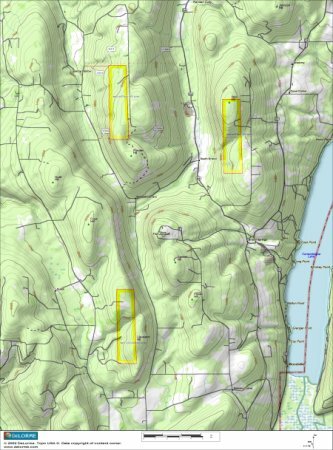 Thanks to the latest edition of DeLorme's Topo USA 4.0, I can offer this topo map on the web site with rectangles in true dimensions of the destruction to our mountain tops, forests and habitat that will be caused by the proposed wind mill farms. Click here for a full sized 2100x2800 pixel 1.7 megabyte map. The larger map has very fine detail, but will take quite a while to download. 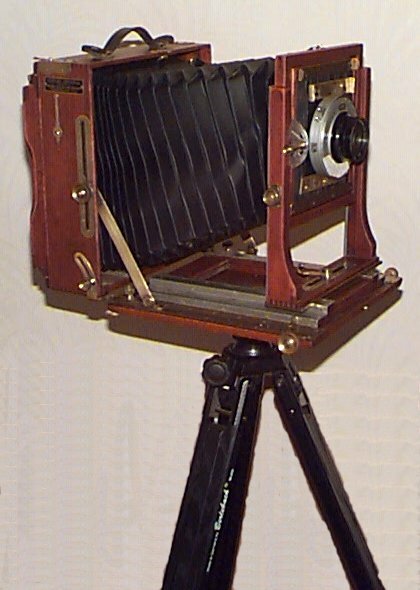 Click here or on the image to the right for a half-sized image, approximately 1060x1400 pixels and 450K. Everything is discernible on this medium sized map, but not as nice as the full sized one. This map is made possible by the good graces of Delorme and their Topo USA 4.0 software and is ©2002 DeLorme ( www.delorme.com ) Topo USA®. According to the June 17, 2002 issue of the Daily Messenger (by Allison Cooper on the 'Local' front page), the Ontario County Planning Board has approved South Bristol's proposal for the moratorium on wind mill farms! This is great news, and thanks again to Allison Cooper and the Daily Messenger for keeping us informed. Now let's hope our Town Board follows through and stops this madness before it gets started. We don't need 1200 acres of devastation on our mountain tops for all the world to see! Wind farms are dependent on federally provided corporate welfare. Federal payouts and tax breaks such as the Production Tax Credit are what allows the current, uneconomical technology to be artificially perpetuated in areas with wind resources. 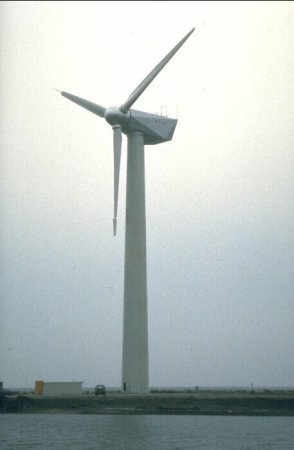 In January 2000, Energy Market & Policy Analysis, Inc. accused the Department of Energy of spreading misinformation on the advantages of wind power. They were also charged with downplaying costs of wind energy by not making clear how much of the true costs are actually offset by tax benefits & subsidies. The current federal subsidy for wind-generated electricity is 1.7 cents per kilowatt hour. The wind industry profits from accelerated depreciation on their equipment which lowers their tax rate. The government allows the utilities to charge more for electricity that has been generated by wind-power. Paul Gipe, one of the nation s leading advocates of wind energy, says "the American Wind Energy Association fell into the trap of measuring its success by the size of taxpayer subsidies." Wind energy is clean and "green"
Wind farms are noisy, area-intensive, materials-intensive and hazardous to birds, including endangered species. Shorebirds and waterfowl are particularly susceptible to turbine collisions because of the birds' relatively slow air speed. Wind farms are prone to oil leaks, turbine blade explosions and delaminations, and the most feared event - turbine tower collapse. Bill Evans, a Cornell University ornithologist, believes that the bird kill rate around stationary towers may surpass 5 million yearly. Wind turbines have all the characteristics of stationary towers in addition to their spinning blades. The National Audubon Society has called for a moratorium on new wind farms until the bird kill problem is solved. They are concerned about the impacts on bird populations in the decades ahead when wind turbines may be all over the country. The wind industry is ignoring this request. Remember: The emissions associated with producing the hundreds of tons of materials used to build the wind farm must be counted against the "greenness" of the project. For just 5% of the nations energy needs to be met by wind, it would take 132,000 turbines operating at an improbably high 27% capacity. Wind is an intermittent resource that can not be relied upon . Wind is usually not available on hot, humid days when electricity demands peak. There must be a reliable source of energy at all times which is why there will still be traditionally fueled energy plants. If you think we're kidding about the wind mill farm proposed for Bristol Mountain, find a copy of the Daily Messenger of Wednesday, April 10, 2002. The front page story by Allison Cooper is all about the farm, and a bit biased in favor of it (as I read it). Yes Carl Schaefer, we are very "ignorant" of what a dozen 300 foot towers adorned with 150 foot spinning illuminated propellers spanning 400 clear-cut acres would look like sitting on top of our mountain! Carl apparently sells these things, so he's not biased at all... And why didn't Phelps knock on my door? I'd sure like to sign that petition! Well, after the April 13 Town Board meeting, we advanced a bit in this fight. Looks like the Town is on our side, or at least listening to us. And I have to thank them wholeheartedly not only for that, but for asking the right questions to Ecogen and for realizing that this is one ill planned project! To keep up on this fight, visit the General Message Board. Read the opinions and add your own... We're NOT against wind power or alternative energy! What we are against is the blanket devastation to Bristol Mountain, and by a company that has never even built a wind mill before! Wind mill farms have a place, but the forested shale mountain sides of our town are not one of them! And I really have to add a "P.S." here. I don't mean for a second to criticize the Messenger or Allison for their reporting. I actually like the Messenger as it's the only newspaper I have ever seen that makes a habit of printing good news along with the everyday bad stuff. And, the people of South Bristol would not have know about this wind mill farm until after it was built had it not been for the reporting of the Messenger! So, even though I offered my opinion of the sway of one of the articles, I whole heartedly thank the Messenger for digging up this news and bringing it to our attention. This is what good newspapers are supposed to do! Thank you! And speaking of biased reporting, did anyone see the 'report' on channel 10, NBC on Wednesday, April 17 on the 6 o'clock news? No attempt was made at all at objective reporting or fact gathering. Did they even try to interview someone who is opposed to these towers? No! Did they make any attempt at showing the actual size of these towers? No! Did they mention that the towers Ecogen wants to build here are much larger than the ones in Weathersfield? No! Did they even say how much noise they make? No! All they accomplished was filling 5 minutes of air time and showing a few of the towers at Weathersfield. Oh-yeah, and interview a few people (who live where?) who don't mind them being built here! It was also nice of them to mention that these towers will be built on the "back side" of Bristol Mountain. "Back side"??? Did they ever think to look at this side of the mountain? People do live here! And I don't consider myself living on the "back side" of anything! But what could we expect from a news service owned by Microsoft? Note: All mentions of "Bristol Mountain" in regards to the windmill farms actually refer to "Worden Hill". The problem is that most references, both with local people, the newspapers and our own Town tend to call this "Bristol Mountain" because of the ski center located on it. Note: All photographs, pictures and artwork displayed on this site are copyright © 2001 South Bristol Views. Any reproduction or other use by written consent only! To get around our site, just click on one of the menu items above.